The whole fish can be strange if you had the fish sticks and catfish fillets first. Perhaps you’ve have bad memories of goin’ fishing and figuring out what to do with the flapping creatures. I once went to a lake with friends and we caught about a dozen little 5-inch scups or something, and I was left with the task of cleaning, scaling and cooking them all. It was not fun and I didn’t cook whole fish for a long time after that. 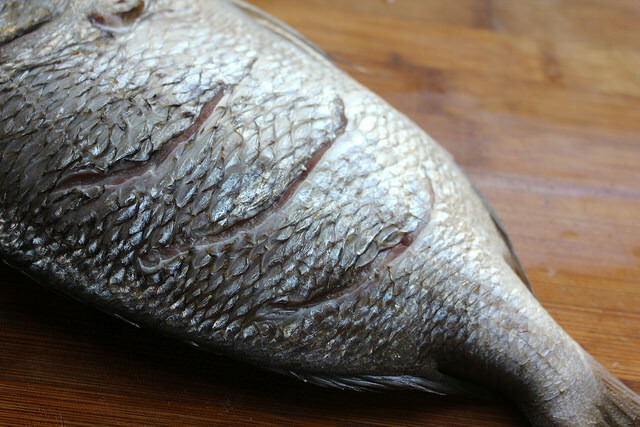 But Chinese New Year calls for whole fish—and it must be a whole fish, not puny pieces or fillets. It’s because a whole fish better symbolizes bounty and wealth and prosperity. That is the whole point. (Well that, and the fact that the word for fish sounds like the word for wealth and prosperity in Chinese.) To me, serving a whole fish also conveys a sense of purity and transparency that I value in my food choices—yes, you’re looking at the whole fish, and nothing but the fish. And a whole fish demands a certain reverence for the creature you’re about to eat. It’s sort of forcing you visually to acknowledge its sacrifice, and take a moment of grace to thank the fish. So it’s Chinese New Year this weekend. What better time to embrace the whole fish? I did a mashup of my two favorite preparations, steaming the whole fish (so simple and you don’t have to worry about flipping it over), and smothering it with an explosion of savoriness. It’s a big bang of flavor for minimal effort, and I hope the fish would appreciate going down in such colorful fashion. 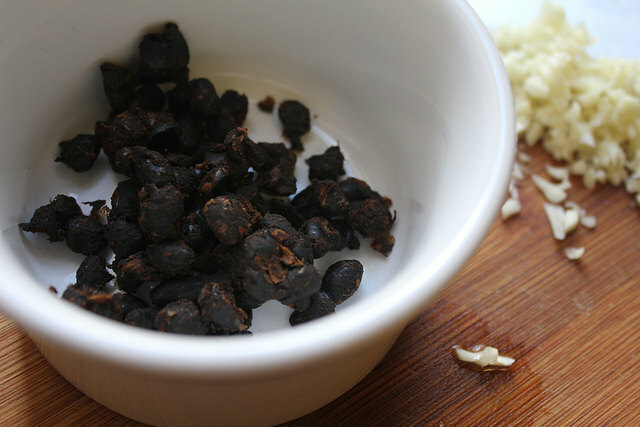 While you can find jars of black bean garlic sauce in the international aisle of most large grocery stores, its main ingredient is fermented black soybeans—and you can get those whole in most Asian groceries. Look in the dried goods area; they’re sticky, shelf-stable little beans that pack a lot of salty, umami flavor. They also blend very easily in any liquid. 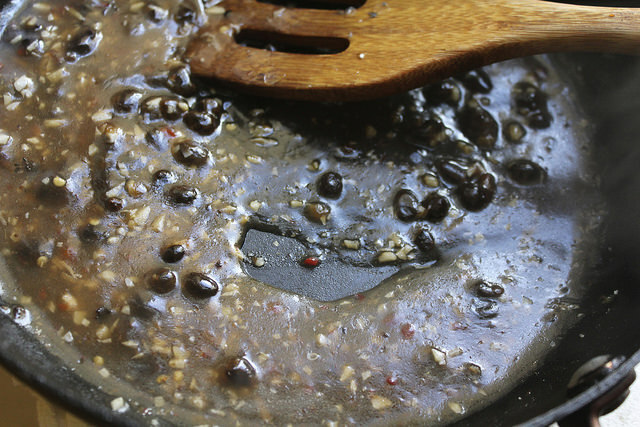 So you can easily create your own black bean garlic sauce with them, and garlic. Add a little chilies or chili sauce for heat, and it becomes a chili black bean garlic sauce, like other prepared sauces in jars. So now you’ve got even more in the way of pure, whole ingredients: whole fish, whole fermented black beans, whole garlic cloves, chilies, soy sauce. Some cilantro as a finishing garnish is nice, too. To steam the fish, you’ll need a large pan, wok or pot with a lid. A small steamer rack or something that can prop up a plate inside it (like an upturned bowl) will be needed, and finally, a plate that’s big enough to fit the whole fish on but fits inside the pot, allowing the lid to close with it inside. The plate should never touch the water at the bottom of the pan, and the fish should not be grazing the lid. So look around your kitchen and opt for a smaller whole fish if you’re not sure your equipment is big enough to steam a bigger guy with. This Chinese New Year, I’m doing something I’m a little nervous about. Since we’re ringing in the Year of the Dog, and I am the proud owner of a wonderful dog, I am throwing a dinner party for only dog owners. About 15 people and a handful of dogs will be present in my small apartment. I am going to give all the dogs red envelopes with doggy treats. And I’m sure I’ll share the menu, which is dog-inspired in many different less-than-obvious ways, soon. But first, here’s a simple and basic recipe for a favorite whole fish dish of mine. Learn to steam fish forever, and add any wonderful sauces you want to it instead next. Or, take the recipe for just the sauce, and add it to your stir-fries with chicken, shrimp, beef, tofu, and anything you want, too. Make sure your fish is scaled and gutted (have your fishmonger do this if possible). Rinse and pat dry with paper towels. Score the fish by making diagonal slits across the front (two or three per side). Rub the sesame oil and a couple pinches of salt and pepper all over the fish, inside and out. Place the fish on a plate. Find a wok or pot that’s large enough to fit the plate of fish inside it with the lid closed. Place a steamer rack (or an upturned bowl) on the bottom of the wok or pot. Fill the pot with at least 2 inches of water from the bottom, but not enough that it comes within a couple inches of the plate once it’s set inside. Set the plate with fish aside as you heat up the water so it comes to a boil. Reduce heat to a gentle boil. Now, place the plate of fish inside, on its perch of a rack or bowl, and close the lid over the pot. Let steam for about 15 minutes, or until the flesh is entirely opaque, peeking inside those slits to make sure it is all the way to the bone. Meanwhile, heat the tablespoon of neutral oil in a smallish pan. Add the garlic and cook over medium-high heat about 10 seconds, until fragrant. Add the chilies or chili sauce and cook another few seconds, stirring. Stir in the black beans and the water. Bring to a boil, stirring. In a separate bowl, mix the tablespoon of cornstarch with a small amount of water. Pour a little into the bubbling sauce on the pan and stir immediately. It should thicken. If you desire a thicker sauce, add a little more at a time, stirring a few seconds afterward, until it thickens. 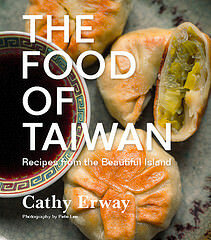 Taste for seasoning, adding a pinch of white pepper or splash or soy sauce if you like, or another dollop of chili sauce. Carefully transfer the steamed fish to a serving plate. Pour the sauce over the top, followed by the chopped cilantro or scallions, and serve immediately. Four maple leaves: This dish is meant to be part of a larger, multi-course meal, but you could serve it with a simple vegetable side and some rice for a simple and healthy meal. By steaming the fish, you’re not adding any oils or extra fats—it’s all pure fish, and that means you’re getting beneficial omega-3 fatty acids found in most seafood. The fermented soybeans lend a little extra protein along with requisite saltiness, and garlic and fresh herbs add some flavorful vitamins and minerals, too. 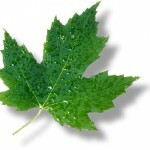 Six maple leaves: This really depends on your fish. 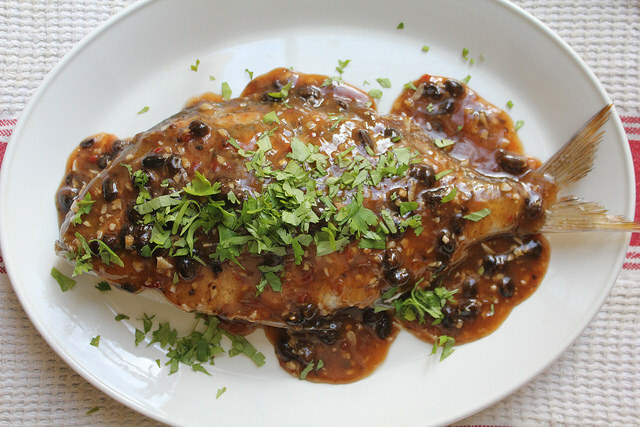 Typically, a whole Chinese steamed fish for a banquet meal is a white-fleshed variety, but there’s nothing to say you can’t use the darker and oilier mackerel, bluefish or trout if they’re fresh and available in your area. These tend to be less overfished than many white-fleshed varieties in general. But there are plenty of exceptions and species of fish in each region, and the sustainability factor of any fish varies from time and place. So check with a trusted fishmonger and use Seafood Watch for general info on varieties. I have never tried steam the whole fish. Thank you for sharing the recipe! It look so good. Thanks for sharing this recipe, it looks amazing! I’m gonna give a try when my parents come over next time! Guys if you want to visit this type of site and its not easily getting then come here and get the result for the work.